I got offered an errend to pick up faction loot tonight. My CEO, a firm beliver in le lazy and da slacker mode of lifestyle was not in the mood to renew the contracts on stuff that wans't selling. He decided to drop it all in the corp hanger and asked me if I'd go and nab them. For some reason I like hauling. Its oddly productive. Really, its the same reason I like mining. So, I jumped to it. The two runs ment a trip to Jita and a trip to Rens. Also, along the way he decided he wanted some Medium Trimark Armor Pump II. On the way to Jita I was side tracked to help chase down a small gang. We chased them through three systems and around the third for about twenty minutes. They were a Hawk, Hurricane, Rupture, and Drake. They *ran* from us. A Drake and a Rupture. Now, truth was we had a Machariel to drop on them on the other side of the gate depending on how they engaged. However, we couldn't get them to engage on a Drake and a Rupture. It was very sad. After screwing around with that, they left system. 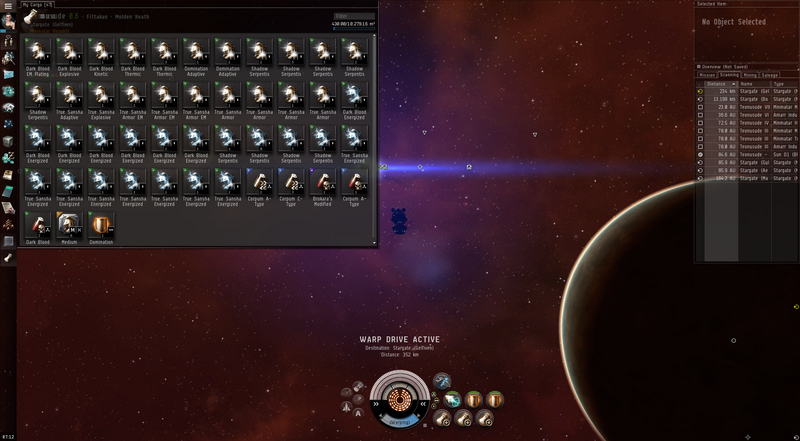 We bailed and I continued my run to Jita. In Jita I went to pick up the rigs (the Trimark armor pumps) and discovered that they cost 67mil each. It made my eyes cross. Spending isk does that. Earlier, someone asked me why I was hoarding isk. I said it is simply because I want to be filthy space rich. One of my corpies reminded me that if I fell into a pond I'd drown under the weight of my current wallet. 400mil later, I was headed out of Jita and back to my high sec base. I decided to decrease my risk by unloading there before I went to Rens for the second half of the load. At Rens I accepted the second contract and headed back to consolidate and head to low sec. Monday night is a good night for this type of thing. This is how I wandered into low sec. Somewhat blinded by the glimmering and sparkle emitting from my cargo hold, I managed to make it to the corp base and unload everything. My CEO loves me enough to reimburse me for the trimarks before I even handed them over. I am glad I did turn into de explosion on the way to drop them off. Hoarding money is probably more productive then my method of buying whatever strikes my fancy that day and then just letting it collect dust later in a forgotten hangar.